SNES Lemmings (USA v1.1) "best ending" in 1:03:04.45 by Lord Tom. Lemmings! This is a SNES translation of the well known and popular game. This TAS, played by Lord Tom, completes the game's Mayhem and Sunsoft levels. We recommend reading the author's level-by-level comments which explain some of the strategies used in the levels. 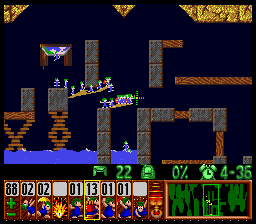 The category "takes damage to save time" was flagged because some of the lemmings were sacrificed for overall best completion time (in some levels, it is even necessary).